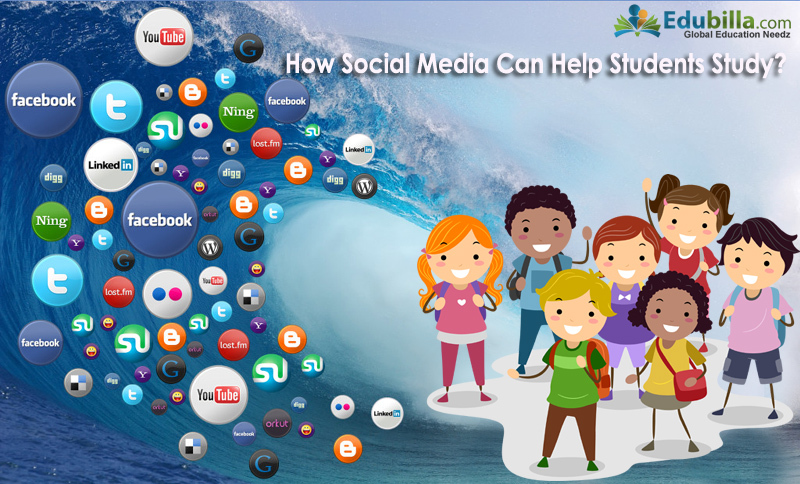 How Social Media can help students study? Days have passed where social media networks have been thought as a distraction for students. Now, Social media is considered as an effective tool that is used by students for personalized and collaborative learning. It provides opportunities for the tech-savvy students to learn and interact with teachers and other students. When this communication platform is effectively used, students will gain more knowledge which will enable them to be special. Social Media networks enable the students to get motivated and engaged, learn socially and to have real time learning experience. Students can discuss on various topics related to the subjects with the teachers and clarify the doubts that they have. Study materials can be shared via this platform as link which will help the students to learn easily. Students can develop their skills by assessing, analyzing, retaining and sharing information. 1)Create a study group, make the students from other schools to join the group, share study tips and invite to teachers to join the discussions made in that group. 2)Start a collaborative study network where students can get the gist of class lecturers that they have missed and clarify their doubts with educational experts. 3)Students can get additional information related to their studies by searching content and watching videos on the topics they need. 4)Announcements and reminders can be given to the students based on upcoming seminars and assignments. 5)Students can send study notes to classmates and ask questions related to that. On the whole social media provides more opportunities for students to learn and gain more knowledge.